Feedback: Notification of any feedback or comments received on your pages, artefacts or journal posts. Feedback on annotations: Notification of any feedback left on an annotation. Group message: Automatically generated by the system, e.g. user request for joining a group. Institution message: Automatically generated by the system, e.g. institution confirmation message, institution removal message, institution request sent to administrator. Message from other users: Sent to you directly from other users of the site. 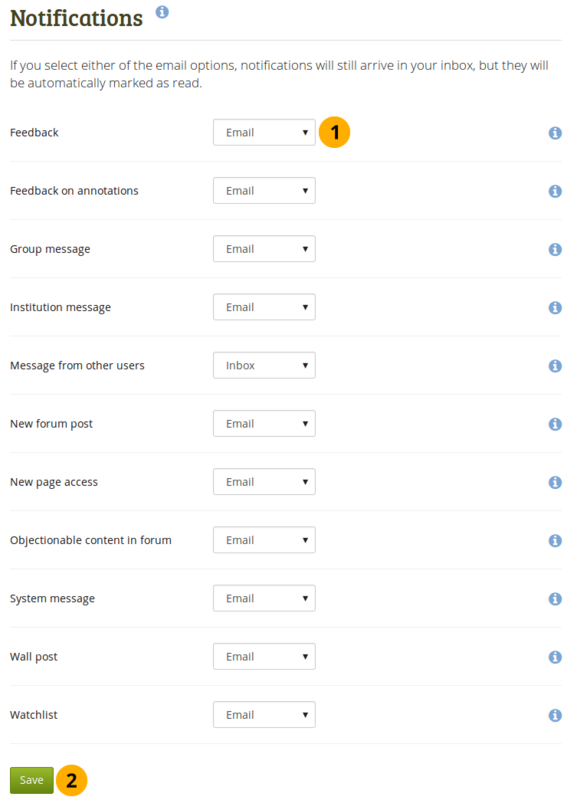 New forum post: Notification about new posts in forums to which you are subscribed. New page access: Notification that you or one of your groups have been given access to a new or existing non-public page. You do not receive notifications about pages accessible to all registered users and the public. The page or collection title is mentioned in the notification so that you can see quickly what the page / collection is about. Objectionable content in forum: Messages to site administrators, group administrators and forum moderators that contain complaints by users about objectionable content in forum topics and posts. System message: Automatically generated by the system or sent to you by one of the site administrators, e.g. account confirmation message. Wall post: Receive a notification when somebody leaves a public or private message on your wall. Watchlist: Notification of activity on any artefact, page or journal you are monitoring. Only site administrators see the notification types of “Contact us”, “Repeat virus upload” and “Virus flag release”. Only site administrators and institution administrators see the types “Objectionable content”. Contact us: Messages to administrators that are sent via the Contact us form. Objectionable content: Messages to administrators that contain complaints by users about objectionable content. Repeat virus upload: Messages to administrators about users who repeatedly upload virus-infected files. Virus checking must be turned on. Virus flag release: Messages to administrators about files that were released by the virus scanner. You may select how you receive notifications for each activity type. Email: Your primary email address will receive an email each time the activity occurs. Email digest: Your primary email address will receive an email each day with a list of the activities of the last 24 hours. Typically, this email is sent at around 6 p.m., but this can be changed. If you select either email or email digest, all activities will also be recorded in your inbox as they happen. They will all be marked as already read. These notifications automatically expire and are removed from your inbox after 60 days. Inbox: Your notifications area will display a list of activity notifications received. None: You can opt to not receive any notifications for certain types. You cannot select “None” for system messages and messages from other users so that you do not miss them. Click the Save button to save any changes you make to receiving notifications. Only an administrator with server access can change the time for sending the daily email digest. The variable $emaildigest in the file htdocs/notification/emaildigest/lib.php needs to be changed for that.